I was going to say that I’ve been thinking a lot about death of late, but really I think death has been making me think about life. Or more specifically, how to live. Influenced by a recent series of guided meditations along with some concentrated reading of Eckhart Tolle, I’ve been practicing “being in the moment” and learning to be comfortable with “not knowing” what is to come. Some days this comes easily and others…well, not so much. At any given moment in each of our lives we are presented with opportunities. In truth, most “opportunities” look rather unappealing as they often appear as road blocks, problems, arguments and challenges. And more often than not, we feel completely out-of-control and put upon, especially when our vision of a circumstance is nothing like the reality we find ourselves experiencing—whether we are sitting in interminable traffic or being given a cancer diagnosis—small or life-changing, it doesn’t matter. We find ourselves saying “…but, this isn’t how it was supposed to be…” Yet it is precisely in these moments, moments of discomfort, that we can find life’s greatest gifts. And what it all boils down to is that the only guarantee we have in life is the present moment. THIS moment. We are not guaranteed happiness, or security, or income, or health insurance…or any of the other things we all stay up at night worrying over. We can’t control the things around us, our family members, the outcome of a baseball game, whether we are hired for a new job. Nada. That’s not to say that we shouldn’t put in the work to achieve our greatest desires. We can spend our moments working toward a goal—whether it’s learning something new, polishing up a resume, or doing something nice for a significant other. But sometimes we do everything we can, we prepare for a particular outcome, and we step up to that door of opportunity only to find it locked from the other side. There are just some doors we are not meant to pass through. Closed doors and roadblocks show up in our lives in all sorts of interesting ways. And sometimes they feel like the end of the world. I feel silly when I think about some of the closed doors that once seemed SO enormous—that perfect job I didn’t get, the cheating boyfriend who broke my heart—the type of thing that once you get some distance, once you travel down the road a bit, you realize how much better your life is because things didn’t turn out the way you thought they should. And then there are the things you must learn to live with. You don’t “get over” or move on, as much as learn to live life in a new way. Not better or worse. Just different than you had imagined. Infertility was one of those things for me. As was my leukemia diagnosis the summer before last. I am at this moment leukemia free, but my life will never be the same as it was prior to getting sick. That’s not bad or good, it’s just a fact. The key for me has been to stop focusing on what I can’t do and instead focus on what I can. To simply stop worrying. For instance, what I CAN do at this particular moment is sit here at my desk and write about what’s on my mind. Which sort of leads me back to death. Next month I could find out my daily meds have stopped working and the leukemia has returned full-force. Tomorrow I could get hit by a bus. Later today I could trip and fall down my stairs. Next week they might discover a cure for Chronic Myelogenous Leukemia and I could be free of the side effects of daily chemo meds. Or perhaps I will die of old age fifty years from now. The point is that none of those scenarios really matter. What matters is today. What matters is the present moment. If tomorrow never comes how do I want to live my today? Morbid though it may seem I find there is nothing more life affirming than a good memorial service. Not a funeral where everyone sits around and cries and prays the deceased up to heaven, but a service where loved ones stand up and share stories. 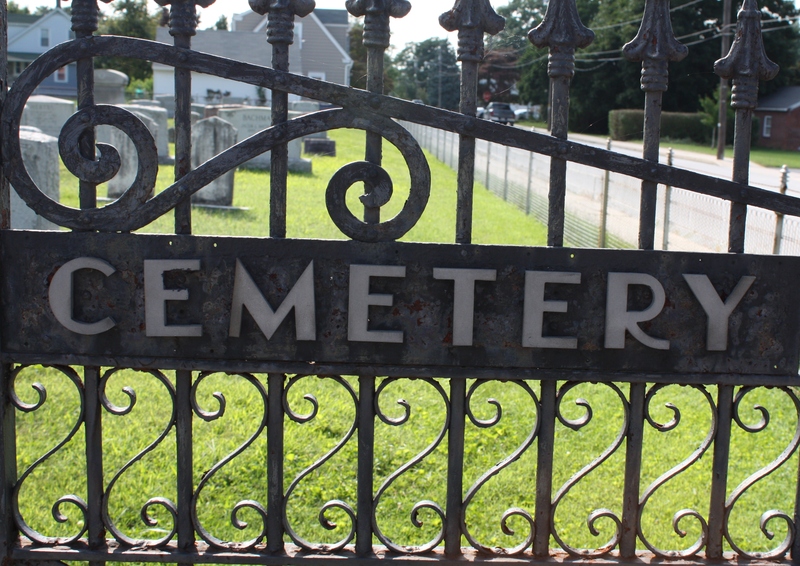 These are especially enjoyable when the dead are eulogized by a well-spoken family member or close friend. Over the past few weeks I have watched the memorials of two high-profile individuals that were made available online. The first was for a man named Lewis Katz, a local philanthropist and businessman, who was tragically killed in a plane crash. Katz had famous friends who took to the podium to speak about his life: a president, a current PA governor, a former PA governor, a newly elected NJ Senator, and a famous comedian, to name a few. We learned he was inspired by the words of legendary basketball coach John Wooden who said “You can’t live a perfect day without doing something for someone who will never be able to repay you.” By all accounts Katz was the kindest of men who made a difference in the lives of those who needed it the most. A self-made wealthy man, Katz was able to take his friends and family on all sorts of adventures. But what I took away from those who eulogized him is that he wasn’t overly impressed by money or titles, and that he could make a grand adventure of walking around the corner to buy a pack of gum at the drug store. He made the most of any moment. The other service I watched was the one in honor of Maya Angelou. I am among the many who were captivated by her story and her beautiful words. I have read her memoirs and poems, watched interviews and heard her speak. And have sought to live by her words. My favorite quote which lives on my dining room wall is “I’ve learned that people will forget what you said, people will forget what you did, but people will never forget how you made them feel.” Michelle Obama was a speaker at Angelou’s memorial service, and she too was influenced by those very words. And she reminded us that while Angelou spoke of being her phenomenal self, she didn’t want to be alone in that feeling, she wanted all of us to be phenomenal right alongside her. The thing I loved most about Maya Angelou’s words is that she understood their power. Words may just be words, but the intent behind them determines their power and whether they will harm or heal. And yes, while the specifics will fade in time, what lives beneath will endure. Last week I visited a friend in the East Kensington section of Philadelphia. Life and death weren’t particularly on my mind when I drove across town to see Jesse Gardner, a talented artist and industrial designer, as we were meeting to discuss whether I could help him develop the narrative behind a particular project he’s working on. I met him at an old commercial building he owns where he houses his Unsung Heroes Gallery. Upon arrival I was told our meeting would be delayed due to a last minute interview scheduled with a reporter from the Daily News who was coming to see a newly finished (not yet dedicated) mural on the side of his building that had been sponsored by the City of Philadelphia Mural Arts Program. 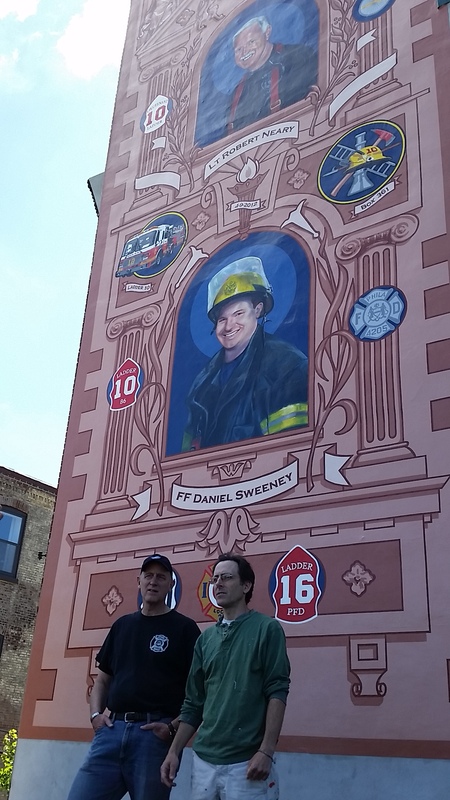 The mural is actually a memorial for two firemen, Daniel Sweeny and Robert Neary, who lost their lives while fighting a fire several blocks away. Jesse had painted the original portraits of the two men that were featured in the mural designed by artist David McShane. Instead of talking about a potential free-lance job, I found myself climbing up to the roof of the building with Jesse, David, and the Daily News columnist Ronnie Polaneczky to discuss the process of creating this bigger than life memorial. I wasn’t at all surprised at this turn of events as Jesse and I initially connected through the portrait of a fallen firefighter many years ago. It was just after 9-11, and my sister and parents were visiting Philadelphia. Everybody was still very much on edge; it was a big deal just to get on an airplane and fly cross-country as my sister just did. We were in the mood for drinks and a relaxing dinner at a restaurant close by my then apartment. As we entered the second floor dining room of Cuba Libre, my father’s face went white and he became visibly shaken. 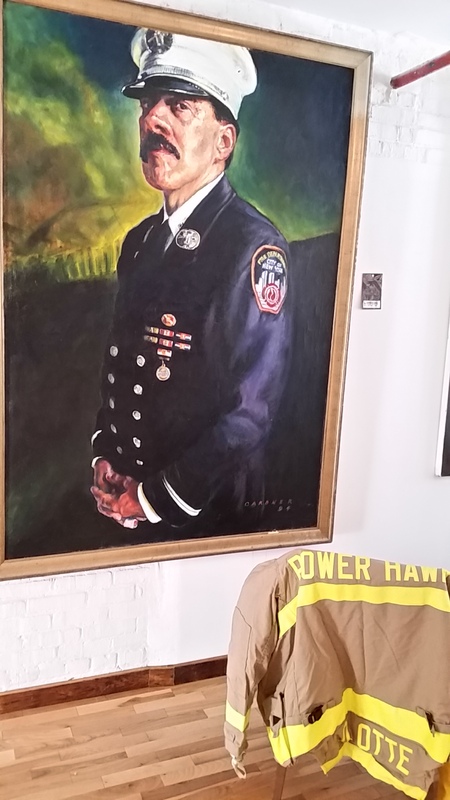 Above the table where we were to be seated was a larger than life portrait of a man named Dennis Mojica, a lieutenant in the FDNY Rescue Company No. 1. The man in the portrait was a personal friend of my father’s who had lost his life at the World Trade Center. We looked around to discover this particular second floor dining room was filled with oversized portraits of firefighters. It was explained to us that these portraits were painted by a man named Jesse Gardner who while living in NYC had spent time painting firefighters. 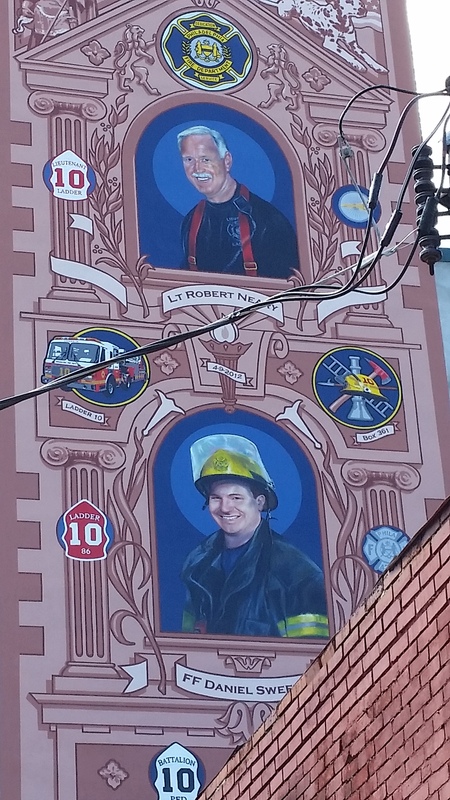 I would learn later that of the twenty firefighters Jesse painted only Lt. Mojica lost his life on 9-11. Had my family been seated downstairs or in the other second floor dining room we would have never noticed these portraits. My father, the loss of this friend (among others) still too raw, asked the waitress to sit us in another dining room so he could enjoy dinner with his family. A few weeks later I reached out to Jesse to discover his artistic journey with these men & woman of the FDNY and his particular association with Lt. Mojica. Up on the roof we had a bit of a discussion about the two heroes—Sweeny and Neary—memorialized over our heads. The question was asked… why would anyone choose a life that included running into a burning building? Of course that is a question that can only be answered by a person who has done so. The fact is that we are all going to die. Tonight, tomorrow, next year, or years to come. 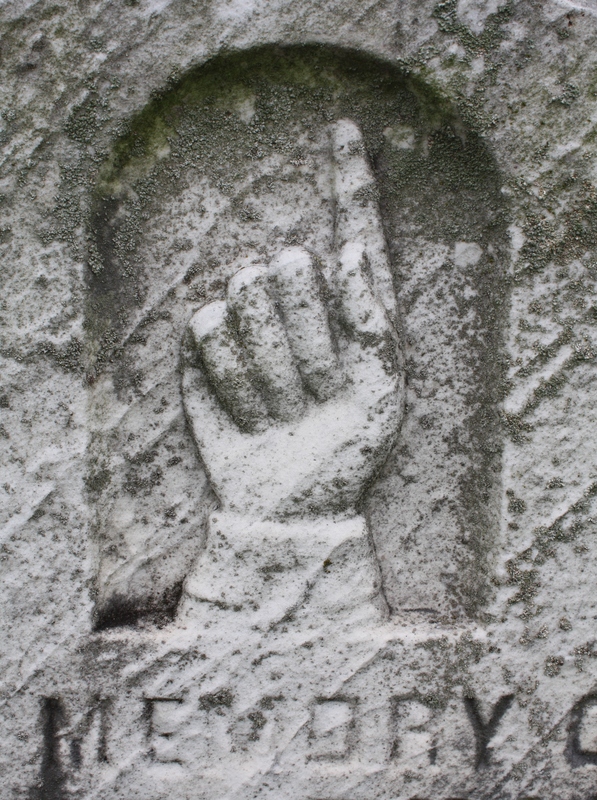 Some of us are just more intimately aware of how our end is likely to come. The key is to not waste another moment worrying about it. Because really, anybody can die. But how will you choose to live? You don’t need to run into burning buildings, donate millions of dollars, or become a celebrated poet. You just need to be your best self right where you are at this very moment. Let go of your ideas, notions, or expectations. Accept where you are in this very moment. Choose happiness. And be grateful. What a wonderful post! Refreshing to read the truth: that we’re all going to die. And, dying is a process that began the day we were born. Thanks, Mickey, for your thoughts on this. Thanks to you for all your support & teachings!